GF Piping Systems (GF) has expanded its automation product line with two new Level Transmitters. These transmitters incorporate advanced radar sensing technology designed for high accuracy tank level measurement in a wide range of chemical processing and water treatment applications. The addition of radar technology to the company’s existing ultrasonic and hydrostatic sensors now provides three different level measurement technologies to meet virtually any level requirement. Radar level sensing technology is based on a transit time principle utilizing electromagnetic waves that are unaffected by fumes or gasses. The process media reflects a part of the energy back to the sensor, which allows calculation of a distance value and in turn the level information. 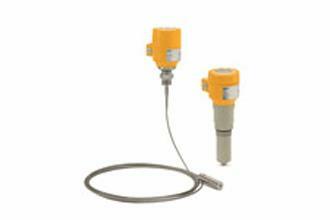 Radar Level Transmitter Type 2290 features non-contact radar technology in a compact, economical unit. Available in a variety of different materials to resist even the most corrosive environments, the 2290’s tank mapping function makes it easy to block out objects like internal pipes, welding seams, stirrers or heating elements. Radar Level Transmitter Type 2291 is designed for continuous level measuring of conductive or non-conductive liquids, pulps or solids and maintains consistent measurement even under extremely tough conditions like turbulent process vessels. Its radar signal is sent down the probe assembly thereby eliminating interferences caused by low dielectric liquids, heavy fumes, conductive foams or internal tank obstructions. Transmitter model 2290 is available with PP or PTFE antennas while Transmitter 2291 is available with either stainless steel or FEP coated rope, or stainless steel or PFA or PP coated rod. Both are equipped with large LCD display for clear visualization and easy configuration. Either HART or analog communication can be used.